Anything that is listed with a "?" is something that the original poster was unsure about. GoukaiGalleon- Red's 3-sailed galleon. Adhered to the bow are two sabres. Also, there are "Spaceship-like" Boosters at the back. GoukaiGalleon forms the head and body of Goukai Oh. GoukaiJet- Blue's jet. Where GoukaiOh's hand is, there is a round barrel. GoukaiOh's hat is tucked behind the wings. Forms GoukaiOh's right arm and hat. GoukaiFormula (? )- Green's racecar. A square barrel is on the fist, versus Blue's round one. This is the car's bumper. GoukaiMarine- Pink's submarine (colored white w/pink accents). The tip of the submarine forms an ankle, but the upper part of the back is the knee. The location for its "cap" is a treasure chest. GoukaiTrailer- Yellow's tractor trailer (cab part). Similar to pink, cap is also a treasure chest. As stated before, GoukaiOh can enter a finishing mode, where cannons protrude from the different "caps". Galleon's bow opens up completely, with the 3-sails becoming armor. The other's (barrels and treasure chests) open up to reveal their cannons. Combines with GoukaiOh to form MagiGoukaiOh, in which the cannons are removed from the cap-ports, and MagiDragon is installed, adding a dragon head to GoukaiOh's chest, wings to the shoulders and dragon-claws to the feet. Combines with GoukaiOh to form DekaGoukaiOh, installing tires in the "Vulcan Ports". 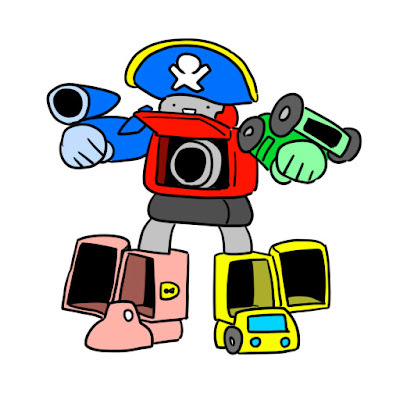 GoukaiOh is armed with Dual-Guns made from the PatStriker parts. GaoLion's alternate combination with GoukaiOh is interesting, because it doesn't seem to be a Gaoranger combination at all. The sillouhetted human-type robo combo seems to actually be a Shinkenger mode! GaoLion's head is on the chest, and the helmet has two-points, similar to ShinkenOh or SamuraiHaOh. The open Vulcan ports have the Shinkenger kanji on them, two "Ka" on the chest, "Sui" and "Ki" on both shoulders, and "Ten" and "Do" on the legs. The form itself resembles SamuraiHaOh, at least in sillouhette. A folding type cell phone henshin device. The upper portion it transformed into the "GoukaiMark" and light is emitted. On the lower button is a place for RangerKey insertion. More than 190 kinds of sounds are possible, with the device able to recognize 200 types of RangerKeys. Comes with GoukaiRed, Go-OnRed and ShinkenRed keys. The Rangers' gun sidearm. When pushes the trigger, an upper part of the gun appears for key insertion. The Keys seem to be used to activate a finishing move. Comes with GoukaiBlue's Ranger Key. The Rangers' sword sidearm. Able to utilize the Ranger Keys. The GoukaiMark on the guard emits 7-colored lights. Official press material has called this the GoukaiKen. It unsure, at this time, what names they are going with. Sabre is obviously a bit more pirate-y. Can store one ranger key in the belt buckle (in essence, similar to Shinkenger's belt buckles). Comes with GoukaiGreen and GoukaiPink's Ranger Keys. Scaled down versions of past Sentai arsenal. Included is the MagiPhone (12 sounds), ShinkenMaru, Mobirates, and another item. A MagiRed key is included. Scaled down versions of Past Sentai mecha. Utilizing the Mugenbine joints, each set runs you 3,000 yen. Releases include GaoKing (splits into the 5 power animals), EnjinOh (splits into the 3 Enjin, and looks able to form G12), MagiKing and DekarangerRobo. SD-type ranger figures, sort of lego like. Transforms into a key by raising both arms, and then raising the lower half of the body forward from the back. The key part is made from a resin looking material, colored grey. When inserted into the Mobirates a "click" sounds.